Texas is known, obviously, for its bigness. When many of us think of Texas films we think of Westerns with wide open spaces. So the Texas movie we're going with here is... Office Space. 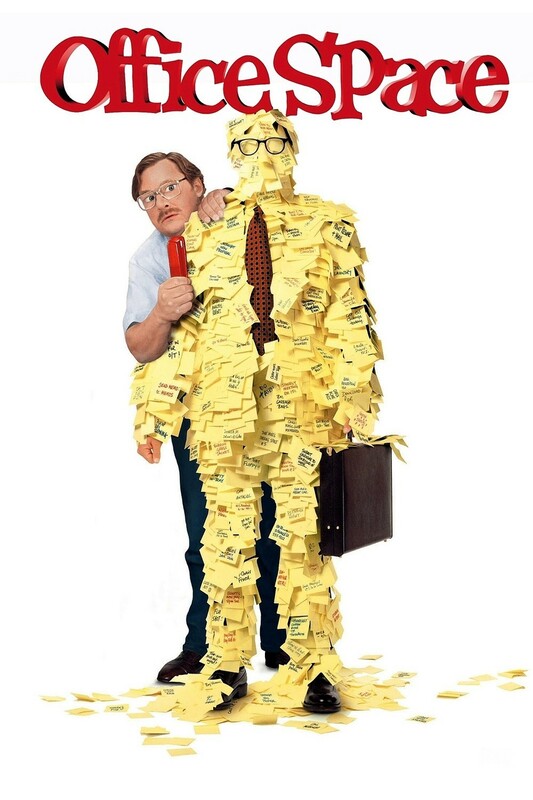 A film about guys working for a tech company, confined to their tiny little cubicles. It has become a cult favorite that is oft quoted, especially in the work place. "Someone's got a case of the Mondays" and a Gary Cole Lumbergh accented "That'd be greeeeaaaat" have brightened the life of many an office drone. Written and directed by Texas native son, Mike Judge (creator of Texas-set Idiocracy and Texas-set animated TV show King of the Hill) has throughout his career shown there is a lot more to Texas than just cowboys. There's not much spiritual content to Office Space on the surface, but at its heart the film is about the search for meaning in a sterile corporate world. The film resonates with the Preacher of Ecclesiastes that "Vanity, vanity, all is vanity." Those who feel a brotherhood with Peter Gibbons (Ron Livingston), Michael Bolton (David Herman), and Samir Nagheenanajar (Jay Naidu) in their life of meaningless code should turn to that book. But there are so many other films set and filmed in Texas. One of my favorite writers is Larry McMurtry, whose novels in the Lonesome Dove series went to television. Many of his Texas novels went to the big screen, such as The Last Picture Show and its sequel Texasville, and best picture Oscar winner, Terms of Endearment. But my favorite McMurtry Texas film is Hud with Paul Newman. Some of the best filmmakers working today have made films in Texas. The strange and delicate Wes Anderson's first two great films, Bottle Rocket and Rushmore are set in Texas. Texas native son Richard Linklater set his classics Slacker, Dazed and Confused, and Boyhood in Texas. My favorite filmmakers working today are Ethan and Joel Coen, who set two of their better films, Blood Simple and No Country for Old Men, in Texas. I would call two of Robert Duvall's films the best films ever made about church, Tender Mercies and The Apostle, which are both set in Texas. A great Christian film, The Trip to Bountiful is also Texas set. I probably can't avoid mentioning one of the most critically acclaimed horror films of all time, The Texas ChainsawMassacre. I know this will surprise you, but it was filmed and set in Texas. And yes, there are Westerns set in Texas. Why not go straight to straight to San Antonio. There are two versions of the greatest of Texas legends, The Alamo with John Wayne and the version with Dennis Quaid. Speaking of the Alamo, we did go to see a Western, The Revenant, at the North Park Alamo Drafthouse. For years I've read about the Drafthouses being on the frontline of again making movie going a pleasurable experience, and they do many, many things right. For those who miss shorts and cartoons before a film, the Drafthouse shows fun things, not commercials, even before the lights dim. It seems they also custom the short for the film being shown. Before The Revenant, they showed a trailer for Man in the Wilderness, a film from the 1970's based on the same true story as the feature film. But better yet, they had a series of shorts about a couple from India pursued by a CGI bear, and a film series entitled, Guy on a Buffalo. Another plus for the theaters is that they try to crack down on the use of cell phones and texts. But some guy in our road still answered a call. He was done before an usher could address the issue. Another great plus with a little minus is the ability to order food and drinks from a broad menu from your theater seat. You just write what you want on a slip of paper and an usher/waiter picks up the sheet and fills your order. (We ordered the bottomless popcorn bowl, and yes, we did get a refill.) The downside to this is that you might get your bill at a climactic moment in the film. The theaters also have wonderful memorabilia and schedule interesting special screenings and revivals. They definitely earn our two thumbs up.